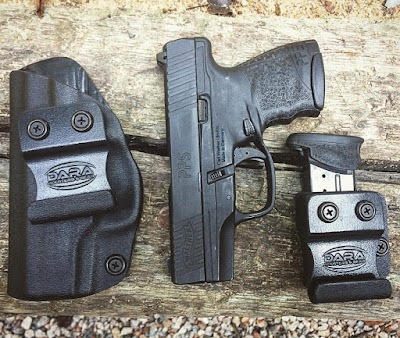 Here's one of our Concealed Carry Packages for the Walther Arms PPS M2. 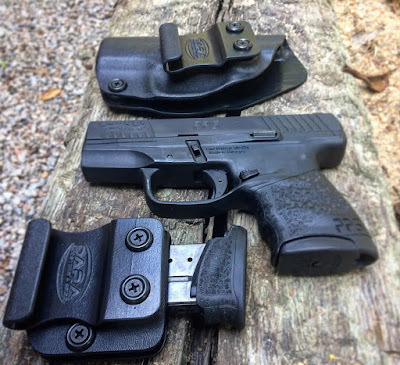 The Concealed Carry Package consists of one IWB Holster and one IWB Single Magazine Carrier. You choose your Firearm, light attachment, color, hand orientation and carry position, belt attachment (j-hook shown above), ride height, cant angle and for the magazine carrier: bullets forward or bullets backward. Here's the set up in action: Left Handed IWB Holster with a high ride and 7.5° reverse cant angle for Appendix Carry. The belt attachment shown is the J-Hook, which slips between the pants and the belt and hooks up underneath. 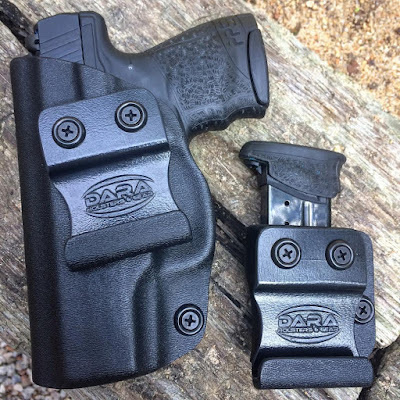 For more information on the Concealed Carry Package and how much you can save, check out the Dara Holsters Concealed Carry Package.